After a couple of months travelling down Australia’s East Coast, It’s almost time for the ‘holiday’ part of my Working Holiday to end and for me to start looking for some work back in Melbourne. The end of this bit of the trip also means that it’s sadly time to say goodbye to my friend and travel companion and instead embark on my own new solo adventure. However, our East Coast travels aren’t quite done yet as we haven’t reached Sydney and we still had one more place to tick of the bucket list first: Byron Bay. Byron is infamous worldwide for being a little oasis of hippies and backpackers in Australia and as soon as we got here, it really did feel like this place is in it’s own little bubble from reality. In a way Byron is how I imagined all of Australia to be: surfers everywhere, smoothie bowls galore, great coffee, beach parties and chilled clubs. Of course all of Australia isn’t like that- and I’m glad that it isn’t but Byron Bay really fits the stereotype. Over the past few months I’ve had a hard time justifying spending $5 on a coffee when I can cook dinner for the same price, let alone spending four times that on brunch, which has resulted in an abnormally absent presence of cafe reviews on this blog. However its turns out that two months of scrounging for leftovers in the free food section of the hostels and debating over which peanut butter is cheaper per kg has paid off and by some miracle I have some money left so, the other day we decided to treat ourselves to brunch out, in typical Byron Bay style. 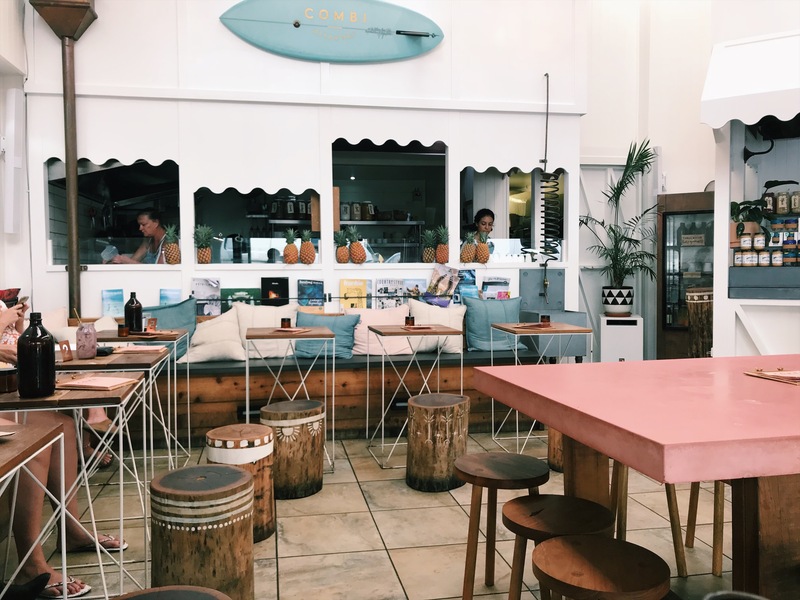 Out of all of the overpriced and ‘totally me’ cafes in Byron, we decided to go to Combi because it has everything you could want out of a Byron cafe: Beautiful smoothie bowls, buddha bowls, vegan cakes and a minimalist open decor. Combi isn’t cheap and I did have a bit of a- ‘how much? !‘ moment, when I saw the $20 veggie bowl prices, but the food is fantastic and if a girl can’t treat herself to brunch out in Byron, then where can she? When it comes to brunch I’m always divided between sweet and savoury (if it’s encompassing breakfast and lunch then I need both sections fulfilled right?) So me and my friend took the only sensible option and split two dishes. We went for Combi’s vegan veggie bowl: a really filling dish of lemony rice, tempeh, loads of veggies and an incredible peanut sauce, along with the organic acai bowl, topped with lots of fruit and granola. If you’re after something smaller then Combi also do the most aesthetically pleasing range of vegan and raw deserts as well as a huge selection of coffees and smoothies. Combi: 5b/21/25 Fletcher Street, Byron Bay, NSW 2481. Main dishes cost around $15-20 USD. Open for breakfast, brunch and lunch. There are Loads of vegan, Gluten Free and Raw options to choose from.